I always do the pies for my family’s Thanksgiving. This year we had a smaller dinner on the actual holiday, and a big party on Friday – the unofficial American holiday “Turkey Leftovers/Mass Consumerism Day.” I chose to do a kind of “Pie Time Machine” approach, starting out with a fresh modern approach to pie on Thursday and getting more and more rustic on Friday. The starting point for this progression was, of course, taken from my current cookbook obsession: Baked Explorations. An awesome, awesome friend with publishing connections got me a free copy and I went straight for this book, and for its autumnal tart recipes in particular, when my parents called up asking what pies I was making. 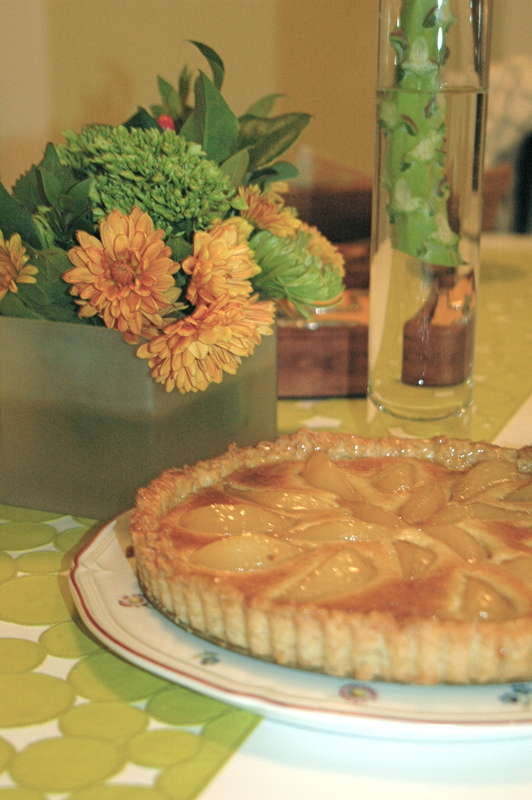 So…Pie #1 (the 21st century pie): Whiskey Pear Tart! Baked Note (this is by the cookbook author): At first, I was hesitant to use canned fruit for this tart, but if you find the right brand (with all natural ingredients), you will get a consistent and wonderful tart every time. If you happen to come across excellent fresh pears at a farmers’ market, poach away, using the traditional method on the opposite page. This is a two day project so make sure you read through all the steps before getting started. 1. Strain the pears and reserve the heavy syrup (for the glaze) in a small, covered bowl or cup in the refrigerator. 2. In a medium, nonreactive bowl, whisk together the lemon juice, whiskey, sugar, and vanilla. Toss the pears with the liquid, cover the bowl tightly with plastic wrap, and refrigerate overnight. 1. Put the sugar, flour, and salt in a food processor and pulse until combined. 2. Add the butter and pulse until sandy (about 6 to 10 quick pulses). 3. Add the egg and pulse just until the dough begins to form a mass. 4. Form the dough into a disk, wrap it tightly in plastic, and refrigerate it overnight (or for at least 1 hour). 2. Ever so gently, guide the dough into the tart pan, without pulling it, and lightly press it into place. Roll the rolling pin over the pan to trim off excess dough. Place the tart pan in the freezer for 30 minutes. 4. Line the tart shell with aluminum foil and fill it three-quarters full with pie weights or dried beans. Bake for 15 minutes, then remove the foil and weights and bake for another 10 minutes, or until lightly browned. Transfer the tart pan to a wire rack to cool. Leave the oven on. 1. In the bowl of a standing mixer fitted with the paddle attachment, cream the butter and almond paste on medium speed until the mixture is light, fluffy, and smooth, 3 to 4 minutes. 2. Add the egg and beat until combined. Sprinkle the cornstarch over the filling and turn the mixer to low. 3. Drizzle in the whiskey and beat until it is combined. Spread the almond cream filling evenly over the cooled tart shell. 4. Drain the pear halves, reserving the soaking liquid, and arrange them decoratively on top of the almond cream. 5. Bake for 35 to 40 minutes, or until the almond cream puffs up and sets and the crust turns golden brown. Let the tart cool on a wire rack while you make the glaze. 1. Place the syrup and soaking liquid in a medium pan over medium heat and gently boil until the liquid is reduced to about 3/4 cup. 2. Remove it from the heat and whisk quickly and continuously for 1 minute to speed cooling. Add the whiskey and cornstarch and whisk to combine. 3. Set the pan over medium-high heat, bring the glaze to a boil, and cook it for 1 minute. Use a pastry brush to apply the glaze gently to the tart. 4. Remove the tart from the pan and serve it as soon as possible. The tart will keep at room temperature, covered, for up to 3 days, but the crust will turn slightly soggy after the first day. 1. Peel the pears, core them, and cut them in half. Set aside. 2. In a large saucepan set over low heat, stir together the sugar and the wine until dissolved. 3. Stir in the orange zest and juice, increase the heat to medium, and wait for the liquid to simmer. 4. Once the liquid reaches a low boil, add the pears and simmer for 15-30 minutes. During the poaching process it is important to make sure the liquid covers the pears the entire time. 5. The pears are done when a sharp knife inserted into the bulbous end of the pear slides in and out easily. Check your pears every few minutes after the 15-minute mark, as cooking time is determined by the size and ripeness of your pears. 6. Remove the pears and let cool if you are using in a recipe, or serve warm with any accompaniment (ice cream, whipped cream, etc.). The poaching liquid can be reused. Store the poaching liquid in an airtight container in the refrigerator for up to 1 week.